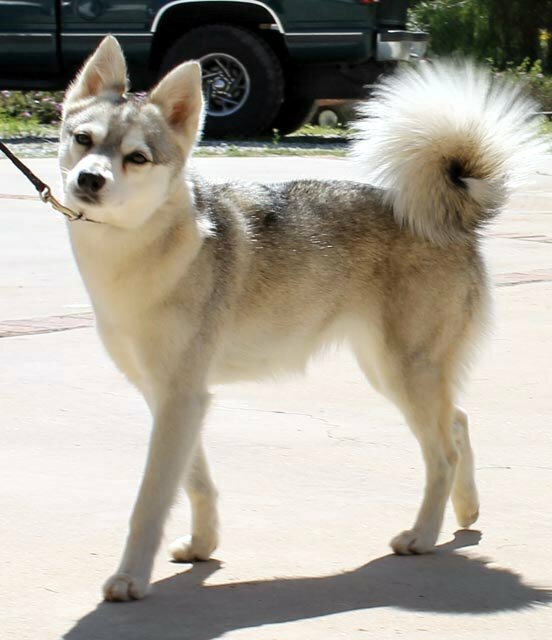 Do Alaskan Klee Kai Shed Hair? So you ask “Do Alaskan Klee Kai (miniature huskies) shed?” My answer is yes. However I find it is very manageable to keep the house, car and clothes almost hair free. Alaskan Klee Kai are breed down to be miniature versions of the Alaskan and Siberian Husky. This means like their full grown counterparts they are double coated. While single-coated dogs have only one layer of fur, Alaskan Klee Kai have two: a top coat and an undercoat. The top coat consists of longer, thicker guard hairs that help repel dirt, water and protects from the sun. The under coat is a softer thick downy layer that helps trap warmth in cold weather that I call fur. Your Klee Kai will shed year round a little every day like just like we shed our hair/skin, this hair is usually the top coat. Twice a year though, usually in the spring and fall, they shed their undercoat. Shedding will start at the hind quarters of the dog, where you will see clumps/chunks of fur sticking out, then work its way up to their head. I know I love to sit and pull the clumps out though sometimes my dogs do not like it. This will usually last for between 2 weeks up to one month and is called blowing their coat. Once they have fully shed their undercoat they return to their normal amount of daily hair loss. So you ask me what are the secrets to managing this? First I like to take my dogs in to the groomer every two weeks where I do not allow them to bath them but I ask for a brush and fluff. This is where they spray product on your Klee Kai, work it down to the skin then give them a good brushing. After they will fluff them up with the hair dryer. The groomers will also clean their ears and trim their nails if needed. When you pick up your baby they will smell wonderful, be extremely soft and free of any loose hair and remain so usually until the next time they go. The cost for this is minimal usually around $25.00. I bath my Alaskan Klee Kai a few times a year when they are shedding their under coat. I take them to the groomers, have them bathed and de-shed. I will do this up to three times while they are blowing their under coat. The bath really helps to loosen all their undercoat plus the product the groomers use works wonders in getting the hair loose so they can brush it out. To combat daily shedding I keep a lint roller made of tape around. I have one in my car and couple inside my home. I use them to get any stray hair off my clothes or furniture. I cover my couch/bed with a blanket that I wash weekly too. I have a pet hair seat cover for the car. I will brush my Klee Kai if needed too. What if you are the DIY type Klee Kai owner? Well then you should brush your dog daily to keep the shedding to a minimum. I do not recommend the furminator it pulls their hair out and destroys their coat. Get the normal shedding brush. When they start to blow their coat then you will bath them. Do not bath them more frequently then once a week, it will dry out their skin and cause skin irritation. There are some really nice de-shedding shampoos, cream rinse plus de-shedding nozzles for sale. Remember to clip their nails once a month, if you are not able, take them to the vet/groomers to have them clipped. Lastly understand that with all the love, joy, humor and companionship your Alaskan Klee Kai gives what is a little fur around the house!